York Housing Association in partnership with Ryedale District Council are pleased to present six properties available for local people to purchase on a shared ownership basis, in this rural community. 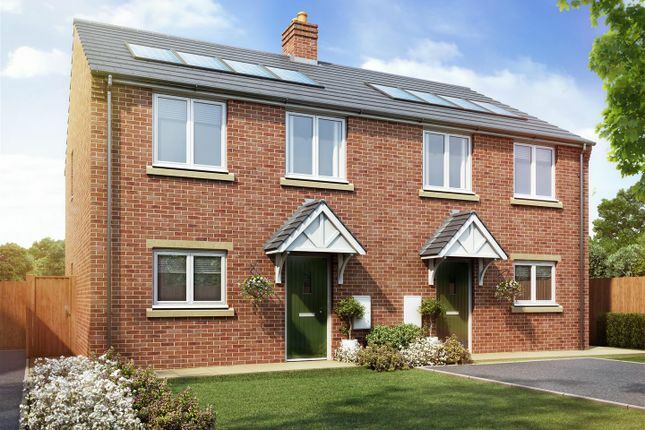 There are 2 two bedroom semi-detached homes and 4 three bedroom semi- detached homes, all with gardens and parking spaces. *based on a 30% share of a 2 or 3 bedroom house valued at either £195,000 or £220,000. All properties are constructed to current Building Regulation Standard (Part L1A : 2013 Ed.). In addition, many aspects of the development are specifically tailored to improve environmental performance, both within dwellings and across the wider site. High levels of fabric insulation, to loft, cavity wall and floor elements. High efficiency, argon-filled, double-glazed windows. Highly efficient extract fans, which are continuous-running, but use extremely low amounts of energy. Electric heating systems using high efficiency storage heaters to ground floor living spaces, and a combination of panel heaters and/or towel rails elsewhere. Heaters are with both central and localised controls, and storage heaters have facility to operate either ‘off peak’ or ‘direct acting’. The home is equipped with ‘localised controls’, all of which considerably improve heating performance. Domestic water is heated via insulated Water Cylinder with twin immersion heaters, one of which is linked to ‘off-peak’ electricity tariffs, whilst the other acts as a daytime boost. Use of low pollutant materials, and avoidance of environmentally hazardous materials. Use of certified timber, responsibly sourced from managed stocks. Controlled water flows from taps and shower units. Dual flush, low volume cisterns to WCs. Renewable Systems All plots have been equipped with varying levels of Photovoltaic (pv) Panels to roofs. These harness solar energy during daytime, to self-generate electricity and service electrical appliances, in lieu of using power from the grid. Pv saves running costs, however savings are optimised during daytime, as/when panels receive sunlight. Please note the images shown are for illustration purposes only. Property descriptions and related information displayed on this page, with the exclusion of Running Costs data, are marketing materials provided by Willowgreen Estate Agents, and do not constitute property particulars. Please contact Willowgreen Estate Agents for full details and further information. The Running Costs data displayed on this page are provided by PrimeLocation to give an indication of potential running costs based on various data sources. PrimeLocation does not warrant or accept any responsibility for the accuracy or completeness of the property descriptions, related information or Running Costs data provided here.